Liturgical quilts are marvellous fun. They need to fill a great space so they can be very very large, they can be as abstract as you like, as colorful as you want, and need to fire the imagination of the people. Whatever religion you belong to, celebrate it, rejoice in it, and decorate for it! People are often surprised that I make liturgical quilts, and speak about them when I go to guilds. Religion is a highly personal, highly subjective topic that most quilters avoid like the plague, probably with good reason. I have made three large quilts for different liturgical seasons for my Church because the quilts demanded to be made, and I was the instrument. It is a magnificent challenge to try to translate Scripture into images, to make words into color and light and physical form; besides, it gives me a splendid excuse to make large quilts. The great challenge in making quilted liturgical hangings is to try to turn words and amorphous scriptural images into fabric art that will enhance the liturgy, relate to a wide variety of people, and promote a higher understanding of the Word. There are additional challenges, however: the work must fit the space, be able to be seen by the whole church, be relevant, beautiful and inspiring, yet not distract from the religious service itself. Care must be taken not to duplicate images (why make an image of a candle when you have a real one? ), and if it has to be explained - it hasn’t done its job. Piece of cake, right? No wonder it’s hard to get people to make liturgical hangings. What if you are asked to make a wall hanging for church, but feel inadequate and don’t think you can really DO it? Remember the story Robert Fulghum told about the building of the Cathedral of Chartres. When asked, the Sculptor decorating the entrance of the Cathedral said he was making a statue; the Stained Glass Maker said he was making a window; but the old woman sweeping the floor of the Church said she was building a Cathedral to Almighty God. Think about it. You have to ask yourself if you are the best person available for the job, and if you are, just bury your inadequacies and get ON with it, because this is YOUR part, your work, your contribution to the universal Church. And, yes, I KNOW you’re on a budget or are just making this for free out of the goodness of your heart, but let’s stop making things for the church out of felt and crêpe paper, okay? It’s okay for little kids to make color crayon drawings and posters festooned with sequins and macaroni, but that is NOT appropriate for adult worship. Let’s have a little dignity and AT LEAST the same degree of craftsmanship you invite into your own homes. Don’t tell me you regularly color egg cartons and cut up construction paper and add a few felt flowers and decorate your walls with the resulting creation; or use ripstop nylon and puff paint in your bed quilts - yet that is what I’ve seen in some churches for the main decorations at various seasons. Let’s face it - it’s TACKY, TACKY, TACKY. Of all things, art dedicated to the glory of the Lord deserves some time and energy, some thought and care, and some significant part of the wealth of creation He has given to us. I don’t charge the church for my time or materials when I make a liturgical wall hanging; I just make it, show it in church at the appropriate time, and show it in other venues when it’s not being used in church. I feel that it if I have to count the cost of my time, or account for the materials penny by penny to the church’s administration, I can’t afford to make it. You really can’t quantify how much a quilt is going to cost you, anyway - especially not when it contains a large part of your time, a big piece of your heart and a sizable chunk of your soul. Liturgical quilts don’t come easy and they don’t come cheap - but what worthwhile things do? People have been making religious art for centuries - building cathedrals and making stained glass windows and chiseling marble statues and painting magnificent oil paintings; you have to wonder, sometimes, what were the real motivations behind the artists’ work. How much of this art was created to showcase a particular sculptor’s work so he could make a name for himself and get other commissions? How much was done for the challenge - just to see if the artist could do it? How much of it was done to fulfill a contract - just to make some money for food and shelter? And how much of it was done gratis, with a pure and simple heart, all for the glory of God? We’ll never know - but I suspect that these works of art were done for all of these reasons, and many more. Looking at myself honestly, I must admit that I had several reasons for making liturgical quilts. One reason was that I was truly uplifted by the words and by the work growing in my hands, and really wanted to spread the Good News to others in this visual fashion; but I also enjoyed the pure challenge of making fabric art that has a deeper meaning because of the symbolism inherent in the Scripture. I also loved making something for a wall that was 24 feet wide and 15 feet tall - it was just too good an opportunity to pass up. More importantly, though, I made those quilts because I got a vision in my head and just couldn’t NOT make that vision a reality. Take Pentecost, for instance, where it all started. Pentecost readings are incredible - they fill your head with fire and flame, light in darkness, death and rebirth, silence and roaring wind and the breath of the Holy Spirit. Immediately, you see images in your mind’s eye, don’t you? I saw them, too, sketched them out, then decided that it would be much too hard, I didn’t have the skills to do it, didn’t know how to begin, it would be much too expensive, and it probably wouldn’t turn out, anyway. But, it did no good to speak to myself logically, because I wasn’t listening. I found myself buying orange fabric; and gradation dying yellows; and taking a class to learn to marbleize red flame fabric. 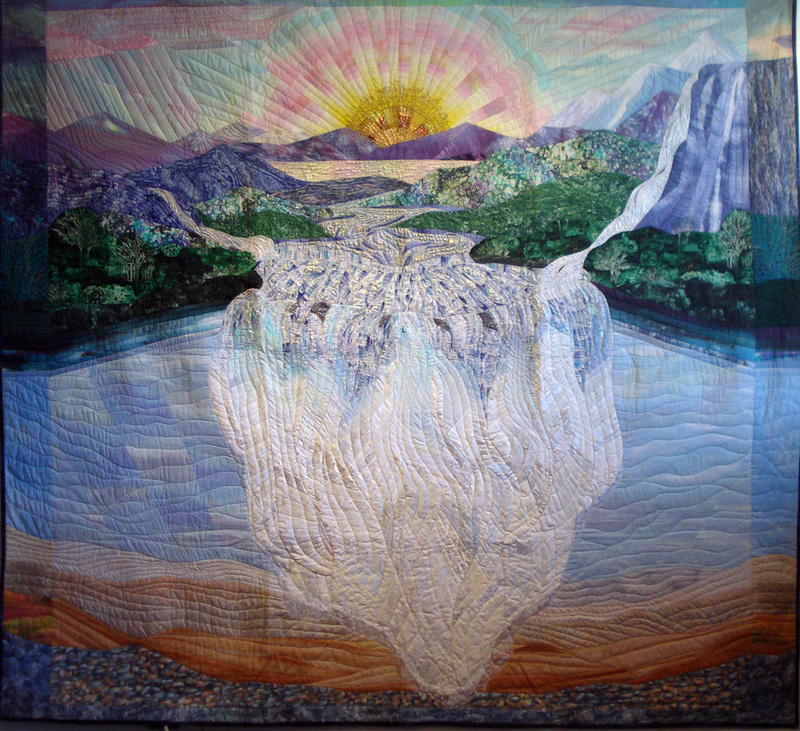 And then I saw Caryl Bryer Fallert’s Eclipse quilt, took a class from Ruth McDowell in compulsive piecing, and wound up taking five months to make a quilt that hangs in my church for one weekend a year, on Pentecost. But then came Advent (“Prepare Ye the Way”), and then Easter (“Water of Life”). There went some more heaps of expensive fabric and another six months of my life, but they were golden opportunities to indulge my passion for quiltmaking, they were Heaven-sent. So if you’re going to do it - throw your heart into it. Do your best, use your most beautiful fabrics and all the time and love you can spare, and help build a Cathedral to Almighty God. But do keep in mind that you’re probably doing it for a lot of reasons, and don’t start putting a halo on your own head. Doing something you feel compelled to do, and feeling indulged because you’re allowed to do it, probably isn’t going to be worth many points in the Final Reckoning, but it will keep you off the streets and out of the bars, and give you a great excuse to make what will probably be one of your best works. It does take a lot of time and energy to make a liturgical quilt, and - all in all - I’m glad I’m not on the Liturgy and Environment Committees anymore. In all probability, I won’t even make any more religious quilts. The only thing is, I’ve been starting to think about the Creation readings lately . . . so - what do you think about seven layers of spirals? On the left is "Into the Light." If you look carefully, you will see an angel flying upwards into the dome, accompanied by a flock of doves. The building is the Palais des Invalides in Paris, where Napoleon is buried. My church hangs this quilt at Christmastime. On the right is "Water of Life." At Easter, the readings are all about water, as a metaphor for the spirit, falling from we know not where, filling the hanging valleys of our lives, and overflowing in a great waterfall into the desert our lives would be without the spirit.